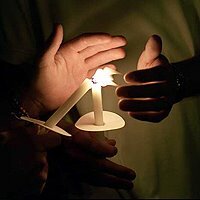 Democrats.com has proposed holding a candlelight vigil to Count Every Vote at every county election office after the polls close on November 7. And they encourage everyone in attendance at the vigils to wear blue. My feeling is that honest, accurate vote-counting is so important that it should be completely non-partisan. My counter-proposal is that all attendees wear white. White is iconically non-chromatic or pan-chromatic. If it were the chosen color, Republicans, Democrats and independents could all join the vigils and remind each other that they are there to ensure that every vote is counted correctly. Rather than having bickering teams wearing their team colors, everyone wearing white would reinforce the idea that we're all in this together. Alternatives to white would be purple (both red and blue) or yellow (neither red nor blue). Or attendees could wear both red and blue in equal proportions, and not one above the other but side-by-side. Or attendees could be encouraged to wear any color except red or blue. The concept of a candlelight vigil to ensure that every vote is counted correctly is inspiring. It encourages us to believe that democracy might actually work sometimes. That inspiration shouldn't be diminished by reducing democracy to the level of a team sport.